Since iOS 6 was officially released yesterday, several bugs have been reported, including issues with Wi-Fi, Passbook, and battery life (although Apple has apparently fixed the Wi-Fi bug). 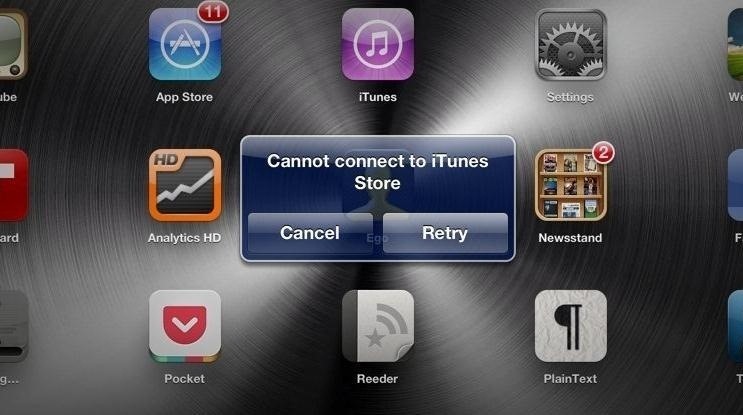 Some users are also having problems connecting to the iTunes Store, which is probably insanely frustrating because the first thing you want to do with a new OS is try out new apps. Luckily, there's a way to fix this by tweaking the date and time settings. Open Settings, then go to General >> Date and Time. Switch the Set Automatically option to Off, then set the date one year ahead. Try to open the App Store again, and if you get another error message, go back and correct the date by switching Set Automatically back to On. Now you should be able to connect with no problems. This may not sound like much of a fix, but quite a few users have reported that it works, and some even say it also helps with the Passbook issues. Now you can get back to more important things, like getting Google Maps back. I could connect to the store but couldn't update apps. I tried this and now it works! I tried this but it didn't work. At our office everyone has an iPad. All of them now have this issue of not being able to connect to the iStore. I did several Wi-Fi tweaks to our router that seemed to help some minor connection issues but no help on the App Store. On the 2 iPhone 5's in the office, both have this same problem with the App Store but if I turn off the Wi-Fi, there are no issues. I tried this but it did not work. I can access itunes but not the App Store. I have tried everything I can think of but nothing seems to work....any suggestions? I ve tried it but it didnt work. it doesnt even give the options to Retry or cancel etc...just simple says Cannot connect to iTunes Store with an simple Ok option. I can connect to App Store but having problem to connect to iTunes Store while trying to connect through Built In Music app to go to iTunes Store. plz help!!! awesome.. worked great. You're a genius.